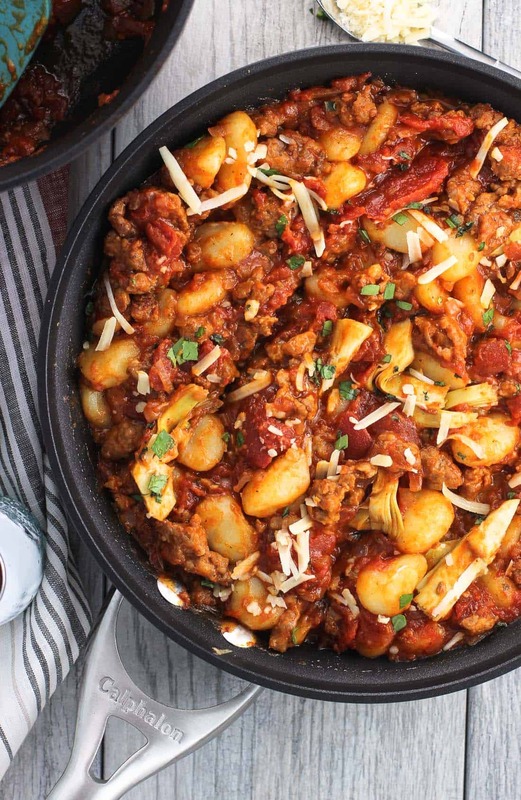 No-boil gnocchi with Italian sausage is combined with homemade marinara sauce for an easy, hearty meal perfect for both weeknights or your next date night dinner. A) It’s date night at home. B) I’m a little bit stressed, ergo in need of comfort food. 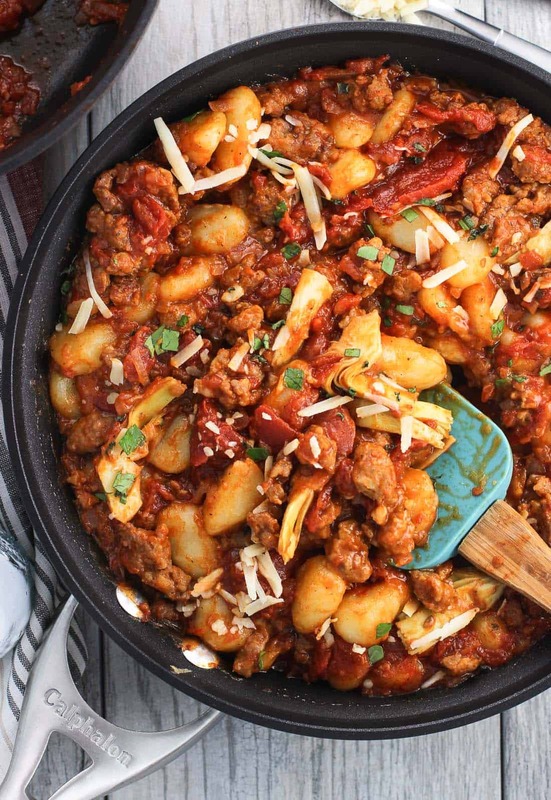 The last time I made this gnocchi with Italian sausage and homemade marinara the answer was definitely A and maaaybe a little bit of B. Brian and I are homebodies who both love food, so cooking and enjoying a meal together is a date night no-brainer for us. I’ll dig out the fancy candles and pour some wine while we don our comfiest of sweatpants. 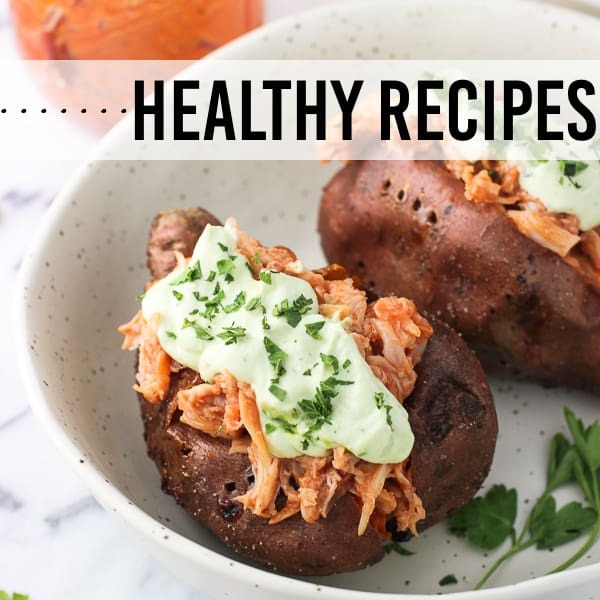 This is such a great opportunity for spending time with one another, all the while experimenting with new recipes or flavors and eating seriously good food. But time, as it does, is going by quickly, and I’ve realized that we have less than a year until our wedding (hence the stress level/need for comfort food). According to one of those wedding website checklists, we’re 39% complete with our planning and are ahead of schedule as it pertains to individual tasks. Yes! 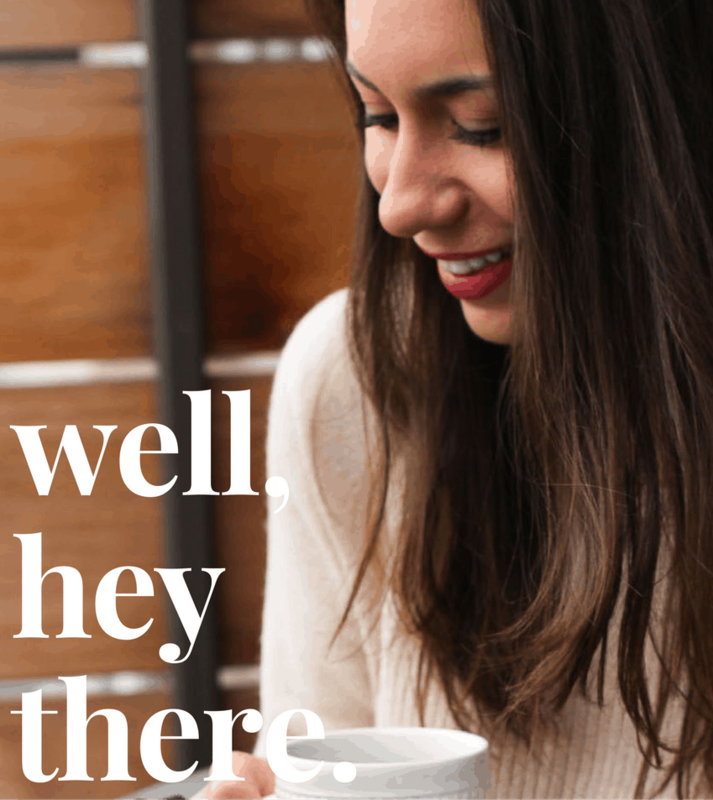 I’m determined not to stress out with all things wedding (at least not yet…) but my propensity for control freakiness has been creeping up and causing me to doubt that checklist and worry that I’m behind schedule. One of the to-do’s Brian and I have been excited to tackle together is the wedding registry. The majority of our cookware/bakeware/cutlery is a bare bones mishmash of items from our first apartment that isn’t holding up well with the amount of cooking and baking we do. Seriously, our old baking sheets warp so badly in the oven that I was afraid my pork tenderloin was going to be launched right off. 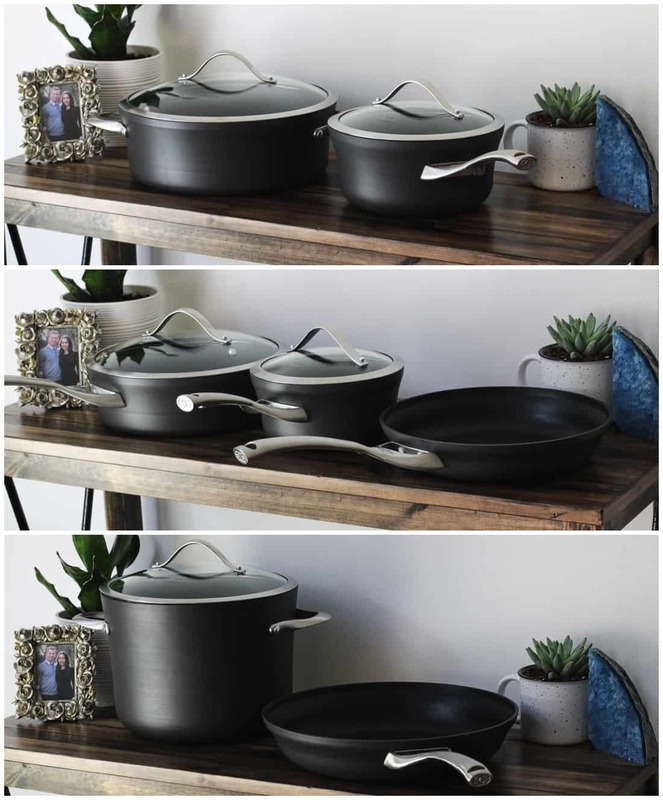 So when it came to adding long-lasting, quality cookware that will last for years to come to our wedding registry, we chose a wide variety of Calphalon products. They’re of the highest-quality, expertly crafted and designed, and help us cook to bring out the best in every meal. 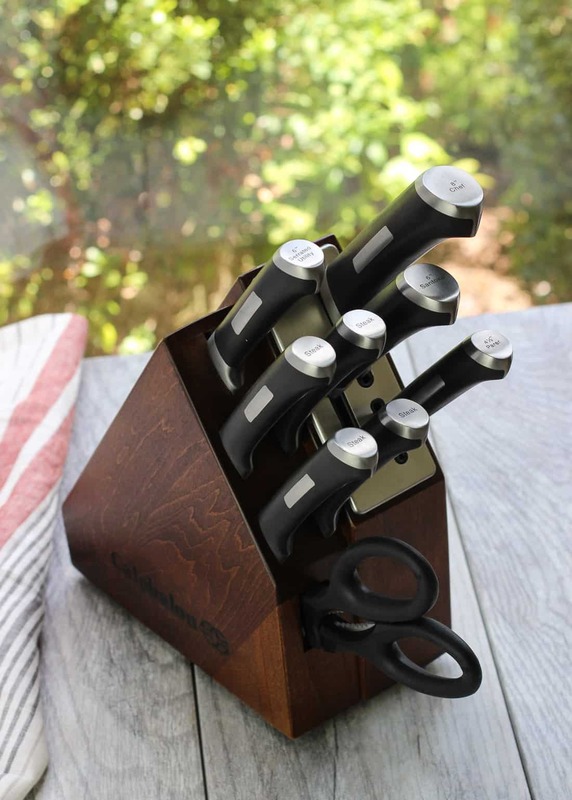 The Calphalon Precision™ 10-Piece Space-Saving Self-Sharpening Knife Block Set was the very first thing we added to our registry. Our kitchen isn’t huge so I appreciate its compactness, and how cool are those self-sharpening ceramic slots on the right hand side? Plus the maple wood block looks quite handsome on display in our kitchen. Right off the bat I noticed that the baking sheet included in the Calphalon Signature Nonstick Bakeware 6-Piece Set was incredibly hefty. No more worries about warping here! I used the two 9″ round cake pans (and the cooling rack) to make my future father-in-law’s favorite chocolate cake when he was here to visit around his birthday, and was so impressed by their construction. Calphalon really means business when they say ‘nonstick’. One of my favorite qualities about the Calphalon Contemporary Nonstick 12-Piece Cookware Set is the stay-cool handle featured on each product. 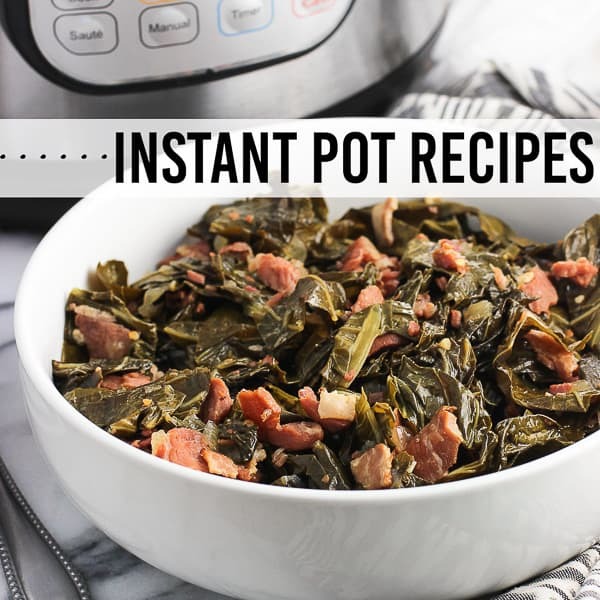 They work perfectly, especially for long-cooking foods like marinara sauce that simmer on the stove for awhile. Plus the whole set is dishwasher-safe! Because after prepping, cooking, and enjoying date night dinner at home, who really wants to hand wash a sink full of dishes? I highly recommend. 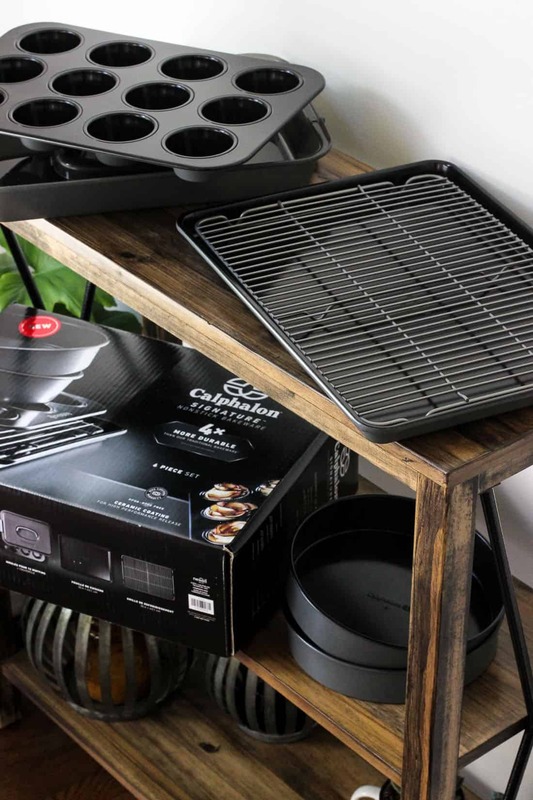 Calphalon products are available to be added to your registries at a variety of retailers, including Bed Bath & Beyond, Crate & Barrel, Macy’s, and Williams-Sonoma. You can learn more about all of Calphalon’s products by clicking here or following them on Facebook, Twitter, and Instagram at @Calphalon. 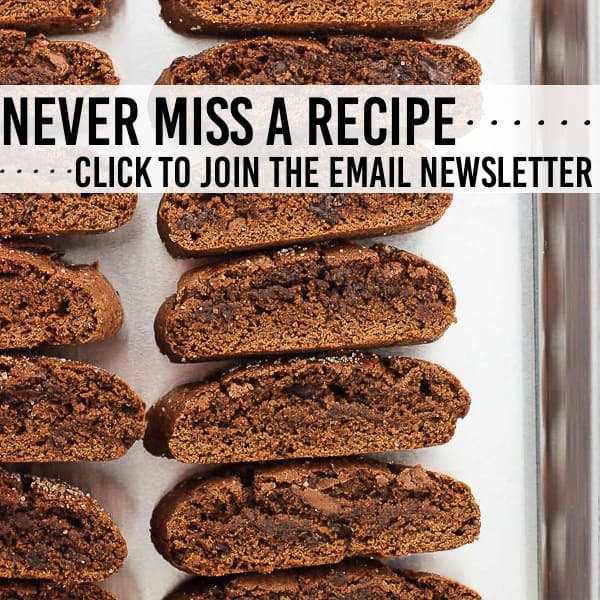 Read through the recipe you’re making from start to finish. This way you won’t be caught off-guard by a lengthy step, such as marinating, chilling, etc. buried down deep in the method. There’s no room for being hangry because dinner is taking longer to cook that you thought it would on date night. Measure out your ingredients before beginning, aka ‘mise en place‘. The last thing you want to do while chatting away and preparing the dinner is to freak out that you’re at a time-sensitive step and you haven’t chopped the onion or uncorked the wine. Kind of breaks up the conversation! And of course, use quality cookware and cutlery so there’s no stress about food sticking to the pan, sauce burning to the bottom of the saucepan, etc. 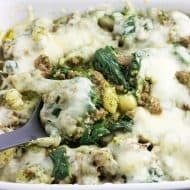 This gnocchi with Italian sausage recipe has been on regular date night rotation in our house. Our date nights center on Italian food for the most part, as we get to reminisce about my trip to visit Brian in Italy as he studied abroad a billion years ago in college. 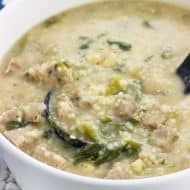 Even if Italian food wasn’t near and dear to our hearts, I bet this would still be a favorite. 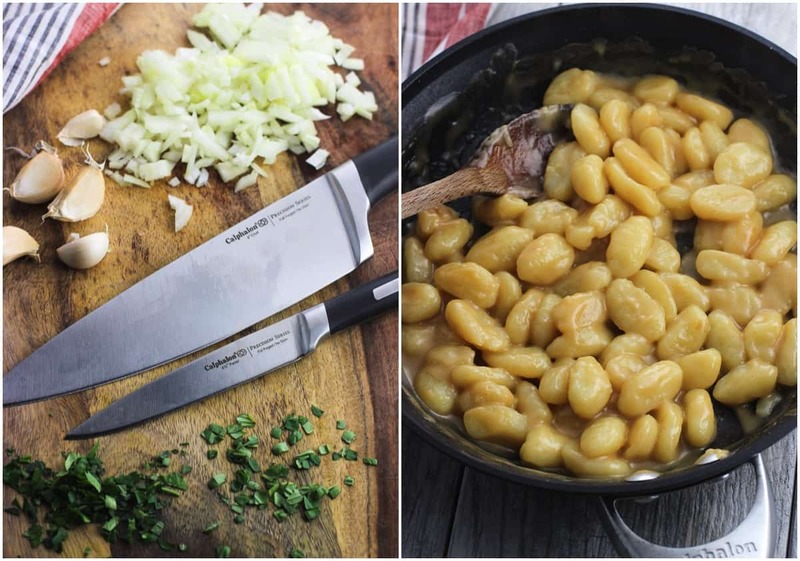 For one, you pan toast the gnocchi in an even mixture of butter and olive oil – no boiling required! 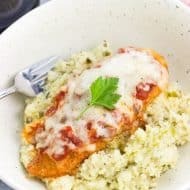 While you’ll be stirring in homemade marinara sauce to this recipe, adding broth and allowing it to reduce down results in a super creamy gnocchi coating that definitely adds to this recipe. It’ll take a few extra minutes, but it’s worth it. You can use Italian turkey sausage if you like, but I’m partial to hot Italian (regular) sausage here. 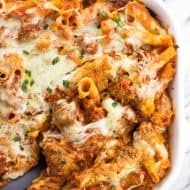 Using hot sausage certainly adds a spicy zip, so if you’re not a fan of that you can use mild sausage. As for the marinara sauce, the chunkier the better. Usually I’ll use crushed tomatoes in my homemade sauce, but I was afraid it would be too liquid-y. 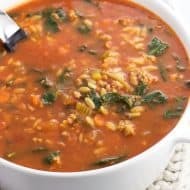 Using a can of whole, peeled tomatoes and roughly crushing them as the sauce simmered worked beautifully, as the tomatoes weren’t lost in the pan once everything was mixed together. Heat 1 tbsp olive oil in a 2.5-qt saucepan over medium heat. Add chopped onion and cook for 5-7 minutes, or until onion is golden-brown. Add minced garlic and cook for another 1-2 minutes. Raise the heat to high and wait 30 seconds or so, moving the onion and garlic around the saucepan. Pour in the red wine and keep the onion and garlic moving around the saucepan. Continue for 1-2 minutes, or until the majority of the wine has reduced. Reduce heat to low. Add the tomatoes and their juices, parsley, oregano, salt, and pepper and stir. Gently crush the tomatoes in the saucepan using the back of a wooden spoon, a potato masher, or even the top surface of a meat tenderizer (that's what I used). Keep the sauce simmering while you prepare the rest of the meal, stirring everything occasionally. The sauce will thicken as it simmers - keep it going until it reaches your desired consistency. Heat a 10-inch fry pan over medium heat and add sausage. Break up sausage into crumbles as it browns and cook until no longer pink. Transfer cooked sausage to a paper towel-lined plate while you prepare the gnocchi, and wipe out the pan to use again. Place the 10-inch fry pan back on the stove over medium/medium-high heat. Add 1 tbsp olive oil and 1 tbsp butter and swirl until the butter is melted completely. Add gnocchi to the pan and stir to coat the gnocchi evenly. Cook, stirring up frequently, for 8 minutes, or until all sides of the gnocchi are a deep golden-brown. Reduce heat to medium and pour in chicken broth. 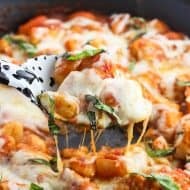 Cook, stirring occasionally, until the chicken broth has reduced just about all the way, and the gnocchi are coated with a thick and creamy layer. 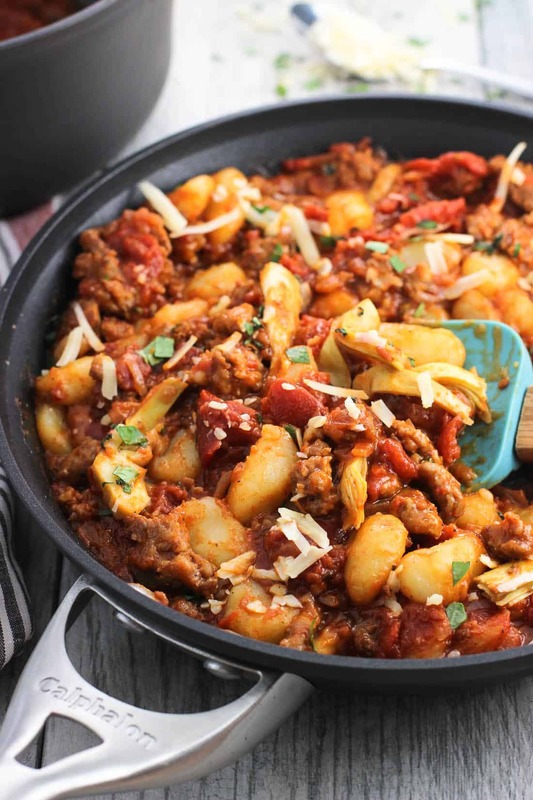 Add cooked sausage crumbles to the pan with the gnocchi and stir. Add in sauce and stir to evenly coat the sausage/gnocchi. Stir in sliced artichoke hearts and top with grated Parmesan and fresh basil leaves (if you like). *The gnocchi I used are 80% potato, and were found in the dry pasta aisle. 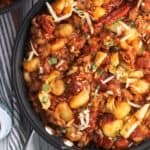 And you don't need to pre-boil the gnocchi before making this recipe! Straight from the package to the pan. Wow wow and wow Alyssa! This meal looks delicious! Calphalon cookware is the best.